Being recognized for her continued commitment to the West Unity Area Chamber of Commerce, Terri Lebowsky recently received the Bright Star Award from the Northern Ohio Area Chamber of Commerce. Terri, who is perhaps best known for running Pete’s Posey Patch, has served on the board a total of four different terms totaling ten years, with her most recent term lasting three years, which included two years of Terri serving as Vice President. She has been a vital part of the board as providing a sounding board for ideas and in the countless hours of volunteer time she has dedicated to helping the Chamber team with coordinating events. This dedication to the Chamber was most likely inherited by Terri’s parents, who also served on the Chamber. Pictured with Terri are Alan Bennett (Chamber President) and Vicky Hawk (Executive Director, Northern Ohio Area Chambers). As Terri has decided not renew her position with the Chamber for another term, it was noted that she will be truly missed by all and that the Chamber is sincerely appreciative of her contributions. 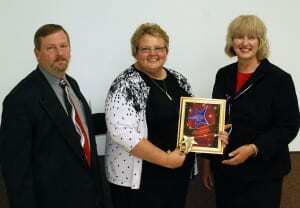 Be the first to comment on "West Unity Chamber Bright Star Award Given To Terri Lebowsky"